It's very easy to reconnect your Facebook account with Fan Page Robot. Step 3: Move your mouse to the left side of your screen, click on the "Connect to Facebook" button. 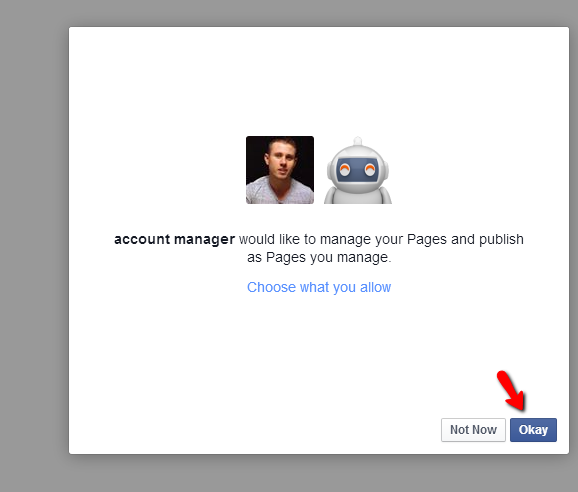 Step 4: [IMPORTANT] Always click on "Okay" when you authorize Facebook with Fan Page Robot. We care about your privacy too, and only request the minimum permissions needed to make the app work. [Optional] Step 5: If you are on a Pro Plan and have more than 3 fan pages, it should pop up a screen to ask you which fan pages you would like to manage using Fan Page Robot. If you are still experiencing any issues, please contact support.